#Breckenridge Family Fun this Summer! Gold Runner Coaster at Breckenridge Mountain, Colorado. Photo courtesy of Visit Breck. What’s there to do in a ski town when there is no snow, you might wonder…. And you certainly don’t want to take the kids somewhere where they will just be bored. But the crowded beaches, amusement parks and typical summer escapes where tens of thousands of other families flock to just isn’t appealing. Consider the charming Victorian town of Breckenridge high in the Rocky Mountains where the air and water are pure, the sun is golden, and the scent of pines delightful, and the glorious backdrop of the mountains almost overwhelming in its beauty. Breckenridge abounds in family fun during the summer, from the simple pleasures of the outdoors including miles of hiking and biking trails, river rafting, fishing, picnicking, a good book under a great tree, and so much more. 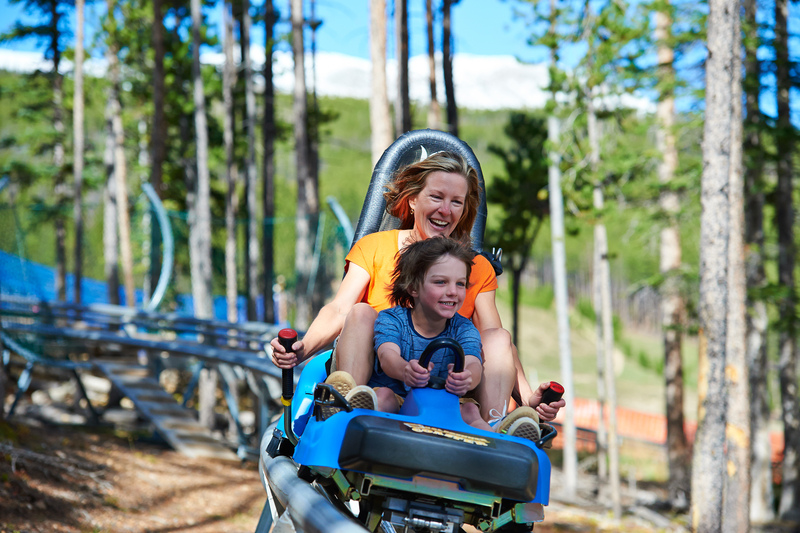 But there is also something for the thrill seeker – the Breck Summer Fun Park! It is located at the base of Peak 8 and has something for just about every family member. An all day adventure begins there, including the TenMile Flyer ziplLine, Gold Runner coaster, SuperSlide, SuperPutt, Colorado SuperChair scenic chairlift rides, Rockpile climbing wall, Mineshaft Maze, pony rides, SuperBungee trampoline, gemstone panning, Ripperoo’s Bounce House, Breck 4×4 Tours, BreckTreks hiking tours, pony rides, and mountain biking. The word “bored” is never spoken here. Convinced that summer in Breckenridge is the perfect family vacation? Then you will want to have your perfect luxury accommodations locked in. Because once you arrive, you will not want to leave. If you can’t sell all of your earthly possessions and just work the lifts for the rest of your life, you might consider a more rationale decision – a second home in Breckenridge. But not just any second home… oh… no! A luxurious condo at the base of Peak 8 with ski in, ski out access. There are only a limited amount of these beautiful treasures…. only 75 to be exact. And expected to become the most coveted address in all of Breckenridge – The Grand Colorado at Peak 8. So… the moral of the story is that the opportunity to own the perfect home away from home in the perfect town of Breckenridge won’t last long at all… remember – only 75 total of these ski in, ski out luxury condos… Complete with every amenity you can imagine. For more information on this very limited opportunity, contact Brent Henry, senior broker and fractional real estate expert in Breckenridge. Call Brent at 970-485-2117. He will help you find the perfect home away from home for you. Or, if you would prefer an owner’s information kit sent to you, just fill out the convenient form below. This entry was posted on May 16, 2015 by elevatemarketingaz. It was filed under Breckenridge Colorado Luxury Condo Sales, Fractional Ownership Real Estate Summit County Colorado, Fractional Real Estate Breckenridge Colorado, Luxury Fractional Real Estate Breckenridge Colorado, Luxury Fractional Real Estate Summit County, Colorado, Summit County Colorado Luxury Condo Sales, Summit County Colorado Real Estate, The Grand Colorado on Peak 8 and was tagged with Breckenridge Colorado accomodations, Breckenridge Colorado condos, Brent Henry Breckenridge real estate broker, Grand Colorado on Peak Eight, Summit County Real Estate.